We're in the middle of a dry heat wave in Seattle, a city usually known for mild weather and lots of precipitation. My cats and dogs (all six of them) are responding by lying about lethargically, which is a great opportunity for me to catch some of my ordinarily bouncy critters on digital film. 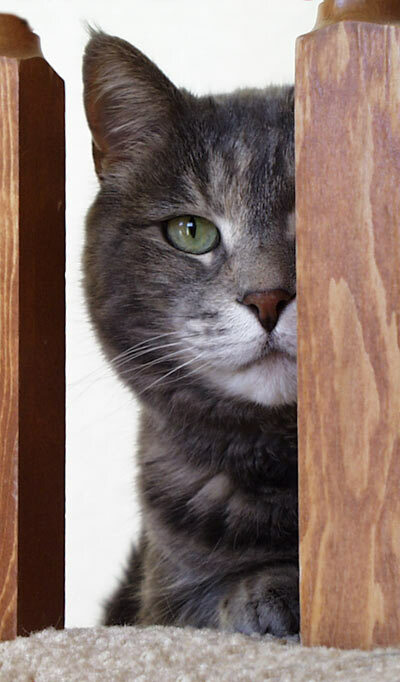 I last wrote about shooting animals several years ago, in "Photographing Your Pets." That advice still holds, but I thought this was a good time to take a fresh look at the art of pet photography, with five tips you can use to get sharper, cuter, more memorable pictures of the four-legged members of your family. Sure, you can spend a lot of time staging the scene and coaxing your dog to sit just so... but I've found you'll get better photos with a fraction of the effort just by keeping your camera handy and waiting for your pet to express its unique personality. 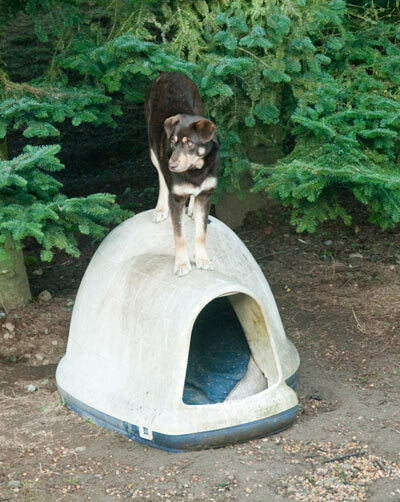 My dog, for example, loves to stand on top of her igloo dog house, sort of like a real-life Snoopy. Why stage something when I can just keep a camera near the window and snap something like this? A moment like this one--in which a wolf cautiously sniffed my wife's face--is too precious to dilute with a lot of background noise. I maneuvered to a place where there was light falling on the wolf, but my wife was in shadow. 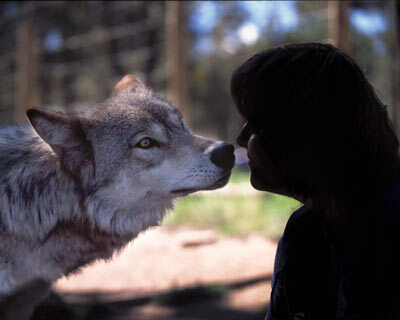 I then locked the exposure by setting the camera's exposure system to spot meter and pointed the camera at the wolf. This had the effect of casting my wife in silhouette, so all eyes would be drawn to the wolf. Even so, I found that there was too much detail visible in my wife's face in the original photo, so I darkened her in Photoshop with some selective burning. It should be no surprise that your camera flash--especially used indoors or in low light--has the regrettable tendency to cause red eye in humans. In fact, I've told you in the past a number of strategies for eliminating red eye in your photos. You can easily get a similar effect with animals, of course, and it can look just as creepy. 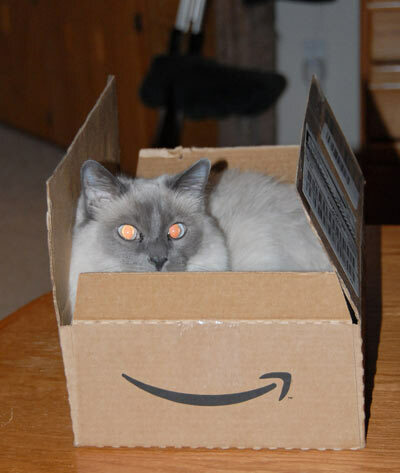 Corel's Paint Shop Pro remains the only program I've found that does a serviceable job of removing animal red eye. Even if you have Paint Shop Pro, though, I'd say that it's still easier to turn the flash off and avoid the evil eye to begin with. Don't always shoot your pets from normal human height. You can get great results by getting down on the floor, at their own level, but that often invites curiosity. If I lie on the floor, my cat or dog will invariably wander over to see me before I can take more than a couple of photos. 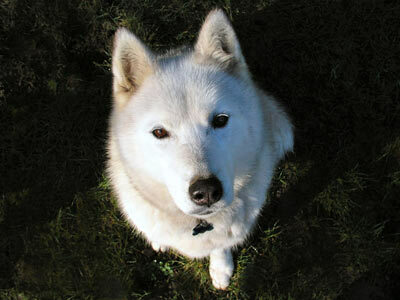 Another option is to get up high and shoot straight down, like I did to capture this, my all-time favorite photo of my now passed-on Husky, Tumanna. Finally, all the artistic tips in the world will only get you so far. You still need to remember to set your camera to a fast shutter speed, because animals operate on an internal clock we humans will never understand. They twitch, dart, snap their heads, and jump for unknowable reasons at the most unexpected moments. Be sure to set your camera to Shutter Priority and dial in the fastest speed available, or use your Sports or Action mode. Feel free to increase the ISO to net a better shutter speed, so you can get a sharp photo no matter what your pet is thinking.